One UK retailer has detailed how much the HTC 8X and HTC 8S Windows Phone 8 handsets will set you back when they land in November. Having had its pricing confirmed with HTC UK, Unlocked Mobiles has opened its pre-orders, promising the HTC 8X for £398.98 and HTC 8S for £224.98. We checked in with HTC ourselves and, while the company can't share pricing details, it implied that these prices weren't far outside the realms of reality. 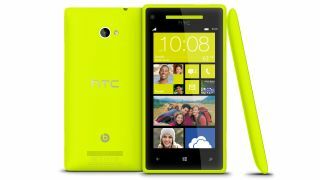 The HTC 8X is also known by the less catchy moniker Windows Phone 8X by HTC, and is the company's flagship Windows Phone 8 handset. It comes packing a couple of beefy amps with Beats Audio tech, as well as a 1.5GHz dual-core processor, 1GB of RAM and a 4.3-inch 720p HD Super LCD screen. The 8S is the lesser of the two handsets, with a slightly smaller 4-inch screen, 1GHz dual-core processor and 5MP rear-mounted camera. Both handsets are expected to get their official release in November, with the HTC 8X expected slightly earlier than the 8S. Until then, read our very early preliminary thoughts in our eyes-on HTC 8X review.